Stationary four bin cold aggregate feeder unit is with each bin capacity of 8 T (in DDM 45), 11 T (in DDM 50) and 14 T (in DDM 60). Cold aggregate feeder includes a 600 mm wide gathering conveyor belt driven by a 5 HP AC motor. It also includes Auxiliary conveyor under each bin which are driven by 2 HP variable speed drive and fitted with adjustable quadrant gates. SINGLE DECK VIBRATORY SCREEN A single desk vibratory screen is provided between the gathering and the slinger conveyor for the removal of the oversize material. The vibratory screen net is 65 mm size and is driven by 3 HP AC motor at 440 V.
BITUMEN TANK A stationary bitumen storage tank of capacity 15 Tons / 20 Tons with direct coil heater is standard with DDM series plant. “O” or “U” shaped single compartmental bitumen tank is fitted with internal heat transfer coils. It is fully insulated from all the sides by a 2” thick mattresses of glass wool and is with vent, pipes, two fill return connection draw of connection and drain. Our bitumen tanks are complete with a dial type thermometer; manhole; socket for thermostat insertion; exterior access ladder to the tank top with walk way and handrails. VENTURI TYPE Wet dust collectors are highly efficient and are known to maintain required environmental standards. The extreme turbulence leads to superb entrapping of dust laden exhaust gas. Large size stainless steel nozzles provide a clog free operation to ensure optimum cleaning efficiency. 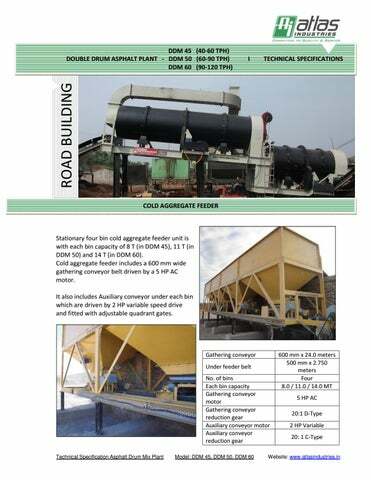 POWER BREAK UP DETAILS FOR ATLAS INDUSTRIES ASPHALT DRUM MIX PLANT Power consumption (in HP) Sr. No. 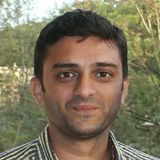 NOTE: With continuous product improvement, specifications are subject to change without prior notice. Accessories shown may not be a part of standard equipment.